In April 2014, the Dutch House of Representatives agreed to allow a consultative referendum on legislation if a citizens’ initiative gains sufficient support. Last year, the political initiative GeenPeil achieved the 300,000 signatures required to demand a referendum on the Ukraine-EU Association Agreement. As a result, a referendum will be held on April 6th, 2016, on a treaty that has already gone into effect as of December 31st, 2015. A majority ‘No’ vote in the referendum will be a major embarrassment to the European Commission, the Dutch government, the Dutch representatives in the European Parliament, and the members of both houses of Parliament, who have already voted to back the agreement. The public image of the EU may suffer as a result, and the treaty may get adjusted. However, the referendum will not mean the end of the treaty. That is not how democracy in Europe works. The elites ruling Europe have learned from the 2005 referenda on the European Constitution in France and the Netherlands, and they will not allow this to happen again. They do not wait for a popular vote before they ratify treaties like this, regardless of the consequences for these same voters. They are presented with a fait accompli. Moreover, on January 20th, almost 3/4 of the European Parliament voted against a motion to respect the results of the Dutch referendum. The European elites will not tolerate any real citizens’ influence. The process of this treaty once again demonstrates that the EU does not exist for the benefit of its citizens; it is a capitalist project. The EU encompasses the closest possible union between European countries based on the shared political, economic, and military interests of their ruling class. It does not exist to make life better or easier for the peoples of the member states. It is not the interests of the (working) masses that determine the direction of the EU, but the interests of the monopolies, who are wrapped in a deadly competitive struggle. They try to maintain their positions at each other’s expense, but especially at the expense of the working people. The original concept of the EU consisted of two major planks. The first is to prevent capitalist wars within Europe. The past two world wars caused too much damage to European capital, while US capital groups were able to make massive war profits from the Second World War. The inevitable capitalist competition could no longer be allowed to cause another major war of destruction; the struggle had to be waged through different means. The EU therefore mainly focused on political-economic considerations. What started with the integration of energy supply and heavy industry (the European Coal and Steel Community) increasingly shifted to a common financial-economic policy. A policy to achieve economic expansion within the EU without the risk of war between member states. The peace between EU member states was therefore not a goal as such, but rather a secondary product of economic interests. The post-WWII power relations meant that this policy could only be formulated under US leadership. Later on, economic relations shifted, and competition increased between ‘Europe’ and other imperialist blocs, like the US and Asia. The smashing of barriers for the benefit of capital in Europe is still ongoing. The implementation of the Lisbon agenda, determined by the EU leaders in 2000, and followed by the Europe 2020 agenda, increasingly adjusts the working and living conditions of workers in the EU closer towards each other. Again, not to improve their living standards, but to relieve the ‘burdens’ on business. There are many examples demonstrating that this comes at the expense of the workers: the abolition of protection from dismissal, reduced unemployment benefits, the demolition of healthcare services, increased tuition costs, and cuts to student grants. On paper, the EU supported unionist attempts to prevent social dumping through wage competition with ‘low-wage countries’, but in practice, the lack of enforcement means that this still happens. Peace was always a secondary matter for the European Community. Its point was always to regulate competition between European business through European legislation and rulings. However, outside of Europe, separate EU member states have always enthusiastically participated in wars, including the suppression of liberation movements in ‘their’ colonies. Independent governments of former colonies that threatened the ‘vital interests’ of member states were targeted for military action by the EU or its member states. The EU’s military presence and actions in the Middle East and North Africa are proof of this. The relative peace in the world after the Second World War was caused by the existence of two global blocs that balanced each other. The force of the Soviet Union guaranteed peace for a long time, along with the other socialist countries and the layer of ‘non-aligned’ or ‘decolonised’ states, which were able to develop thanks to these relations. The disappearance of socialist states and the erosion of the ‘non-aligned’ states has made war a daily occurrence. In Europe, the EU participated in the war in Yugoslavia under US pressure. Although the ruling-class media blamed these wars on ethnic and religious causes, the imperialist interests behind this are evident. The NATO membership of the new Eastern European EU nations, and the discussions about the foundation of a European army, are part of the EU’s imperialist strategic goals. According to the treaty, Ukraine has to end subsidised prices and state support for business, including state enterprises (article 258). Ukraine will be obligated to open itself to flows of capital completely, including new financial products like derivatives. This means an increased risk of business closures and unemployment due to Ukrainian capital owners investing abroad, as happens in many developing countries. Therefore, the Association Agreement fits with the capitalist project of the EU: it works in the interests of EU business and Ukrainian capitalists, and not for the people, many of whom oppose joining the EU. The treaty was signed by a government that includes an openly fascist party and a multi-millionaire president. Based on IMF demands, the Association Agreement prevents subsidised prices and demands competitive energy prices. Between December 2014 and August 2015, this already led to a 453% increase in gas prices. Therefore, the claims of the Ukrainian elites that the treaty will open the EU market to Ukrainian products is meaningless. What Ukrainian products are they talking about? The lack of state subsidies and the multiplication of energy prices means that Ukrainian steel exports (23.1% of Ukrainian exports to the EU in 2014) are no longer competitive. The remaining Ukrainian industry, located mainly in the eastern and southern regions, will be crushed in competition. Free trade with the EU means an end to the low tariffs agreed with Russia, which will heavily damage Eastern Ukrainian industry. 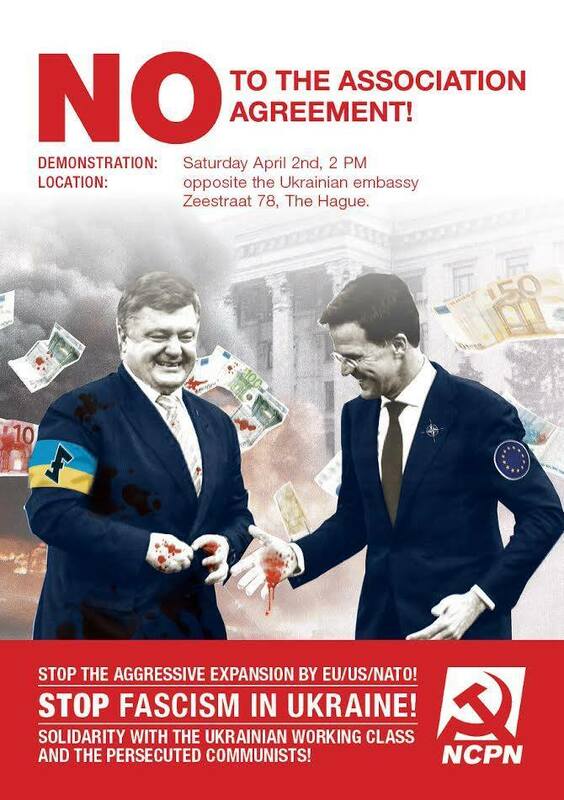 The NCPN calls on the people of the Netherlands to vote ‘No’ to the Ukraine-EU Association Agreement in the referendum on April 6th. The New Communist Party of the Netherlands organises the workers of the Netherlands in the struggle against the capitalist agenda of reforms and austerity, against fascism, for peace and socialism. We cannot remain silent as European capital drags the Dutch people into confrontations with Russia, as in Ukraine and Syria. The threat of war is mounting, all for the sake of capitalist profit. The freedom and democracy that the EU uses as a pretext to mobilise us, really only benefits the rich, the capitalist class, while the working people are being exploited more and more.